Beagle2 was/is for me a very brave project. Its total cost was 1/10th of the American landers and the scientific instruments-to-weight ratio was literally breath-taking. It was surely a UK technological tour de force. Whatever... now the lander is lost for ever, I don't believe scientists will hear anything from it even if they say Beagle will soon enter "panic mode", trying to contact its mothership constantly. But to name the whole project a failure will be a great stupidity IMO! Bottom line, Beagle2 was probably a unlucky ship that can pave the way to many more Beagle-class landers cause the legacy of the compact (and cheap!) robotic laboratory is extremely interesting. "Faster and cheaper" is increasing being shown NOT to work when it comes to planetary exploration. Mars is a harsh mistress, and the only probes that HAVE succeeded have been the big, costly, engineered-to-the-hilt probes. Something like 20 other attempts have now failed. I don't think that you have a grasp on the meaning of "faster and cheaper." The last time that NASA sent to probes to Mars was 1975. It took about ten years to design and cost about US$1 billion to put two landers, that couldn't move, onto Mars. MER took less than three years to design and costs about $820 million. And these things (should) move around the surface of Mars. Considering that 50% of all Mars missions fail, cheaper would, in my opinion, be better. I couldn't agree more. The Beagle2, as I said earlier, probably died in the landing procedure due to a miscalculation (from the most trivial to the really criminal!). All initial testing and parameters were taken into consideration EXCEPT, maybe, the large crater they spotted on the landing site just half an hour before landing (which was impossible to see earlier). We may never learn what REALLY happened to the last detail, but to decline the idea of compact and cheap landers is a shame. 1975 you say? Ummm, that would be wrong. Way wrong. 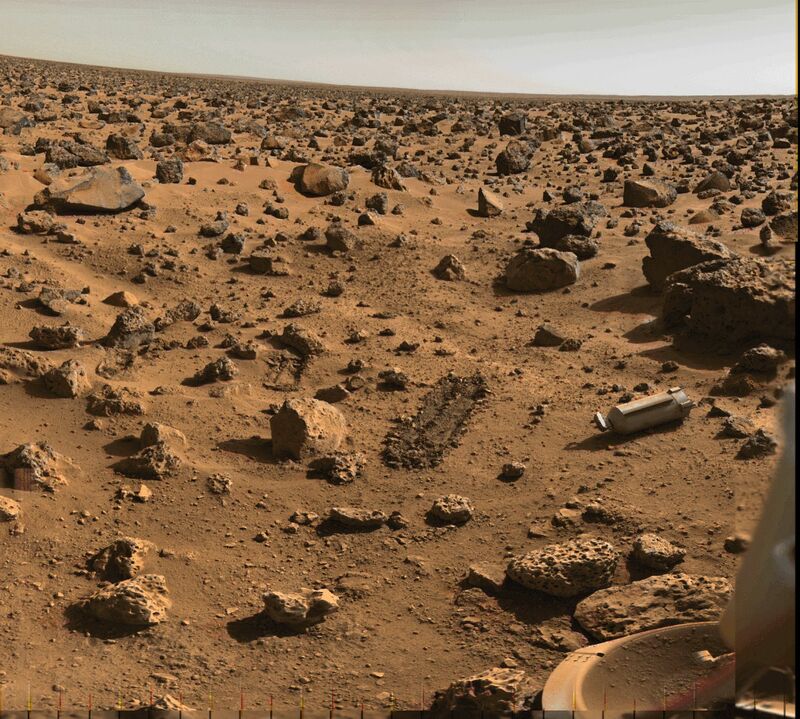 In fact, NASA has sent several successful probes to Mars since then, including the Pathfinder lander and Sojourner rover in 1997. Those two probes alone sent back more science than had previously existed wrt Mars. They also sent the Mars Global Surveyor, which has completed incredible surface mapping, and even snapped the first photo of the Earth from another planet. But let's talk about 1975 too. Viking 1 and 2 were the first sucessful Mars landers, except for a Soviet probe that lasted 20 seconds, transmitted half a video frame, and failed. 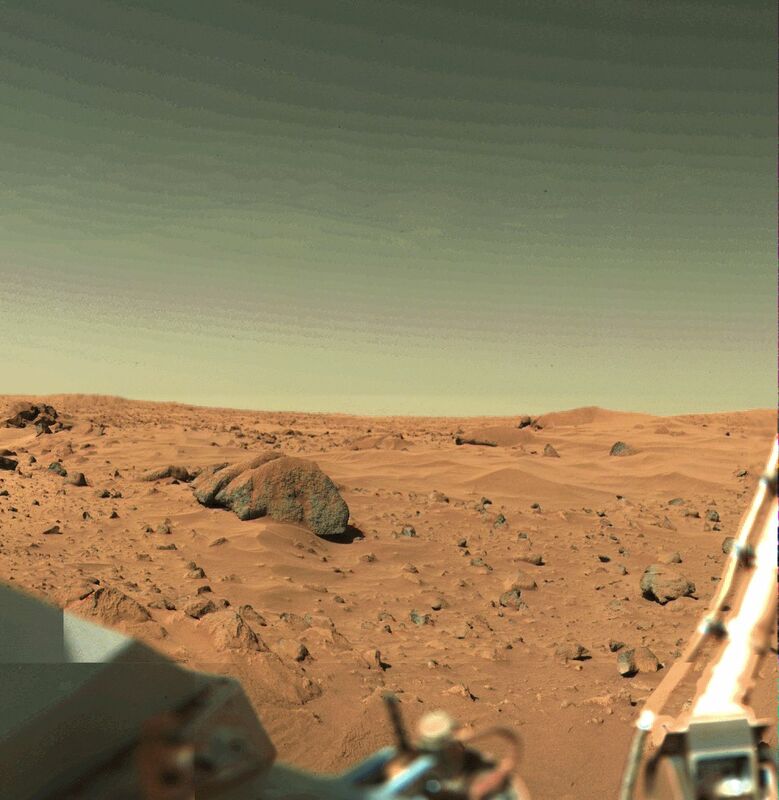 Viking 1 sent back data for 6.5 years. Viking 2 was a comparitive failure - it "only" lasted 3 years. And all during that time they continued to stream back science data and observations to Earth. What do all of the above probes have in common? Two things: they WORKED, and they CUT NO CORNERS. You see, "better, faster, cheaper" is only all of those things when they actually WORK to some degree - and not a single "b,f,c"-type probe has worked. Not from Russia, not from Japan, not from the EU, and not even from the US - and the latter KNOW how to make sucessful probes when cost is no object. When the US tried "b,f,c", they ended up with engineers working with little QA, and fouling up unit conversions and such, and losing the Mars Climate Orbiter, Mars Polar Lander, and two Deep Space penetrator probes. So while people think that they may have a better idea, right now the "b,f,c" probes are like 0 for ?, and the costly probes are MUCH better than 50% successful. Given that launch windows are only every 26 months, which would YOU rather bet your career on??? N.B. - I am unsure how to classify the old Soviet Mars-series of probes - cheaper than Mariner was built, but obviously not of the same sophistication. Somewhere in the middle of B,F,C and Well-Built. Oh, yeah, MY SOURCE for the above data. FS, the R&D on Beagle2 is already done and proved successful. We don't know what went wrong, but surely low cost wasn't an issue. Mass was! According to the consortium that built it, the biggest challenge was to install scientific instruments and the cell-structure itself with the total mass not surpassing 70kg. And all that designed and tested in 3 years for the launch window of 2003. Money was critical too, but the designers didn't complain with their final achievement. Actually, they now only lament the fact they didn't send a pack of Beagles, instead of only one! I'm not so certain (read:I don't think that) that is the case when the cost of the launch vehicle is factored into the equation. Multiple attempts = multiple launchers + multiple mission insurance payments (which are huge). And saying the "R&D on Beagle is done" is a bit, well, wrong. A DESIGN for Beagle has been completed, and a first sample built, but that sample failed for reasons unknown. It could be a fundamental flaw - build 100 Beagles and they would all fail. Or only 85-90% of them fail (which is similar to the record the Soviets had). Either way, it is hardly a proven design, except to prove it as a failure. That's like ME saying that I have a design for a supercomputer, and I tried to build it once, and it failed - but my R&D is all done. Doesn't make any sense, does it? 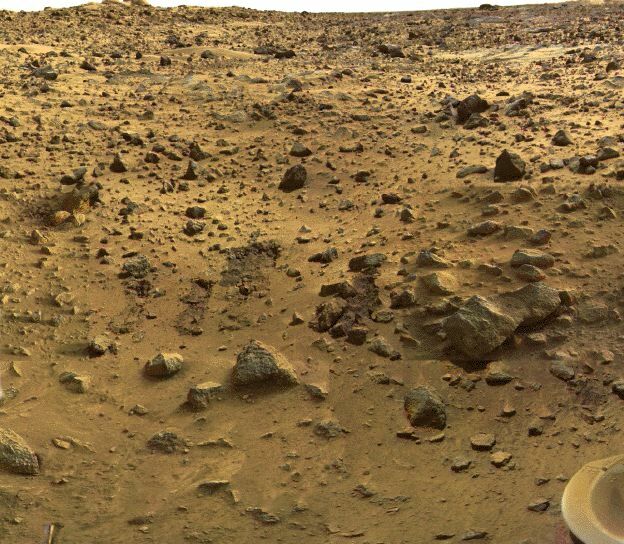 Here, you put up a 16th of the GNP and wait ten years for the next mission to Mars. I'll stick with a few million and the 50% chance of failure. Beagle2 has been designed to complement another mission. The main ESA mission to Mars has been "Mars Express" which successfully entered the Martian orbit. Beagle2 was a secondary payload (that's why it had to be <70Kg). If future Beagle-class landers are sent to Mars in a dedicated mission, one can safely place 4-5 of these spacecrafts on the same launcher (risky if the launcher is unreliable, but certainly less costly than what you implied above). However, ESA's current plans are: if the Beagle2 project continues (as Prof. Pillinger, the program's director said) the landers will always be piggy-backing other missions (European or even American) as long as there is space for the launcher in the payload. And saying the "R&D on Beagle is done" is a bit, well, wrong. A DESIGN for Beagle has been completed, and a first sample built, but that sample failed for reasons unknown. Hey, we're on the 21st century. There wasn't a major design flaw. The tests done here were all passed with flying colors. Prolly with a more sturdy design and some redundancy in the systems (always below 100kg) the Beagle-class landers will make it to the surface alive. There wasn't a major design flaw. The tests done here were all passed with flying colors. Prolly with a more sturdy design and some redundancy in the systems (always below 100kg) the Beagle-class landers will make it to the surface alive. No one knows if there was or wasn't a major design flaw. What if it was the inability of Beagle 2 to do any course corrections once it was separated from Mars Express? If it was at slight the wrong tragectory, or wasn't spinning at the right rotation, they would have no way to correct it. That's something that can be easily fixed and still keep the weight under 100kg. Damn...thanks for the post, I've been working so much I missed it. "We are the goobers of dash. We take this skyvessel as a gift from God. evil DNA manipulation. /Gummi Fisk"
I heard it was "All your probes are belong to us." IMO one thing learnt from Beagle2 and MORE so from Spirit is that as distances of exploration increase and the price (production) drops - its always wiser to send landers in bunchess with a certain fail-safe window. The failure of Spirit could not have occured at a better time. Had there been three identical twins sperated by 2 months apart to landing the next could always be fixed in time. This strategy might be required as each probes gets more and more complex and the amount of code increases. A lesson learnt that could be learnt from "Contact, The movie." Kudos to NASA for sending in Opportunity as well! In fact the most efficient technique to space exploration would be to send a stream of probes like an assembly line and the US is probably the only country which could afford to do this - provided the got some priorities right. This would lead to a boost in space reasearch and technology and maybe be even some amount of commercialization. Ditto to whatever you said. I wonder what would happen if ESA/NASA joined their powers to send the max number possible of Mars exploration mission at the next launch window (2007). We could seriouly examine perfectly the Red planet. Is it so funny to say that we might seriously populate the planet in the next 100 years? I'm 23, I might live long enough to see all these things unfold. There is ice to give us waters, minerals which can potentially be mined... there is interest to go there. Terraforming anyone? Opportunity seems to have landed OK. ESA and JAXA should resend orbiters and landers IMO... we can't be left out of the party! But whenever Mars comes into the picture I end up checking out some details on these two buggers (very British term for "dudes" not to be confused with "boogers" ). So anyways lately I was visiting the NASA archives on Viking missions and I have many questions unanswered like why were there two Vikings sent within such a short span? If the Vikings were so successful why weren't any other vehicles send continuously... even if to learn remote and experiment with long distace robotics on the moon - for say mining purposes? It could not have been more expenive than sending shuttles over and over in space ($4billion annual). Unforunately most of the Nasa links on Viking are dead or non-functional. Plus why are there no pictures of the Viking experimental crafts taken from space? Even if just for curiosity. They have the satellite in place and the technology to do it. Moreover have a look at the links to some pictures I found. I think compared to the current crop of pictures these seem to be more "satisfying" or real - like you are just standing there and seeing the surface. Each one of these pictures looks much sharper and crisper than any of the rovers. They also look for faithful? PS Not that I resent the rovers on Mars so don't get me wrong!